April 12 UPDATE on Storm Recovery/Disaster Relief Volunteer Opportunities. The leadership of the CTC Disaster Response team is reporting that the areas affected by the April 3 tornadoes are in the process of transitioning from “Early Response” into the “Ongoing Recovery” phase of the recovery process. The Red Cross is reporting that 90-95 percent of the homes damaged by the storms were insured. At this time, ERT trained volunteers are working only on an “as requested” basis and there is no official call for other volunteers in the area. If there are any changes once the insurance evaluations are completed, information on how and where to volunteer will be posted on ctcumc.org. Also, the ERT team that was hard at work helping clean the St. Barnabas campus before Easter (see below) was recently featured on UMCOR.com. Click here to check out what UMCOR reporter Susan Kim had to say in her "Response Rapid After TX Tornadoes" article. Members of the Central Texas Conference Disaster Early Response Team (ERT) were in action during the Easter weekend assisting in the clean-up at St. Barnabas United Methodist Church. Trained disaster response volunteers from Morgan Mill UMC, First UMC Round Rock, Grace UMC in Copperas Cove, First UMC Burleson and Ovilla UMC (and probably others) served by clearing trees and removing debris from the tornado ravaged campus of St. Barnabas UMC (just a few of the ERT’s on hand took a break long enough to snap the photo above to the right). An independent church from Pasadena, Texas came up and cooked lunch for the volunteers (see photo below and left) and the United Methodist Women aided the cause by bringing water to the site and stuffing Easter eggs for the church’s Sunday hunt. In addition to the work in South Arlington, Members of First UMC Mansfield and others were hard at work this weekend in Kennedale, Texas, removing debris and meeting the immediate needs of that area, which was also hit hard by last week’s storms. As the sun rose Easter Sunday at St. Barnabas, it revealed more than just the previous day's clean-up efforts of the CTC ERT’s. 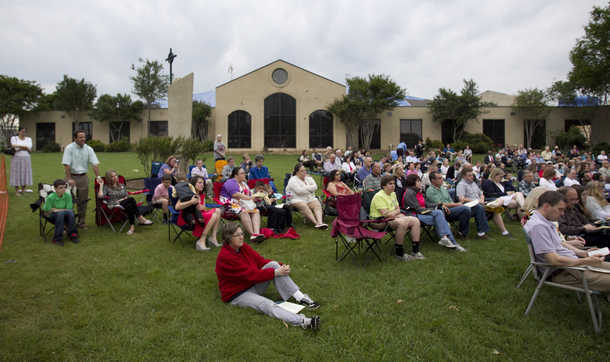 More than 300 members and visitors of St. Barnabas filled the lawn where the crews had been just hours before with blankets and lawn chairs ready to celebrate all that is Easter during a "Sonrise" service (see photo below, right). According to a report from WFAA TV, the much larger than normal sunrise crowd represented those who are desperate to find meaning after Tuesday’s devastating tornadoes as well as a congregation’s full of faith that last week’s events were not an ending but a new beginning for the 35-year-old church. "This is about four times the normal crowd we would have for a normal sunrise service," said Senior Pastor Will Cotton. "We needed to make a statement right in the middle of this community. We wanted to say there is hope and new beginnings here." You can view other news reports on St. Barnabas’ Easter services at star-telegram.com, nbcdfw.com, dfw.cbslocal.com and dallasnews.com. The Central Texas Conference Disaster Response Coordinator, Rev. Laraine Waughtal and the CTC Director of Missions, Rev. Dawne Phillips are working with Tarrant County Voluntary Organizations Active in Disaster (VOAD) today to determine when they will move out of the disaster response stage in Arlington. The team also continues to liaise with VOAD to best assess how CTC volunteers will be able to be involved once the emergency relief phase of this event has concluded. Currently, city and county officials are only allowing those who have completed an official Early Response Team training course into the damaged areas. When asked how others can help, Rev. Phillips stated that besides prayer and financial contributions, awareness in and education of the Disaster Response process is crucial. “This is the perfect time to educate your congregation,” Rev. Phillips said. “Educate them about WHY your members need to be trained as emergency responders and HOW the United Methodist Church works in times of disaster.” For more details on how to register for ERT training, see the ctcumc.org Disaster Response page or contact Rev. Laraine Waughtal (revlaraine@yahoo.com) or Rev. Dawne Phillips (dawnephillips@ctcumc.org). For those who would like to volunteer but haven’t completed an ERT training course, there will be an opportunity to do so in the coming weeks and months. Please click here and fill out a short form and talent survey so that your name can be added to the database of volunteers for future relief efforts that don’t require official ERT training. Continue to check ctcumc.org for regular updates on how and when Volunteer in Mission teams will be able to work in the areas.